At least six villages wiped off the map, hundreds of people turned out of their homes and some of the Broads’ best freshwater lakes swamped by sea water. Thousands of acres of agricultural land turned into mudflats, the loss of bird species such as bitterns, cranes and marsh harriers and the extinction of traditional crafts such as reed cutting. Unthinkable? Perhaps, but if radical proposals currently under consideration for the future of the Broads ever see the light of day, by no means impossible. Conservation chiefs are currently drawing up strategies in response to the effects of climate change in this most vulnerable of areas. With sea levels set to rise, government body Natural England has produced a list of four possible courses of action for the Upper Thurne basin, discussed at a conference in Norwich last month. The options are set out in a document which was distributed to delegates, but has not been made public. Natural England has refused to supply a copy but the EDP has managed to obtain one. The first option listed is to do nothing to adapt to climate change: to fail to maintain coastal defences and inland flood embankments, allowing them to fall into disrepair and be breached by the River Thurne and the sea. The second is to hold the line, the current policy of the Environment Agency. This involves maintaining the sea defences and flood embankments in their current positions. Under this option, saline intrusion – something all farmers fear – would get worse as sea water passes under the coastal dunes. The third option is to adapt the line: allow the sea to flood some places while building barriers and embankments to protect other parts. The fourth and final option is the most radical of all, and is described as the “embayment of the Upper Thurne”. Once the sea has penetrated existing coastal defences between Horsey and Winterton, the area immediately behind would flood as far as two “retreated defences” – think of them as sea walls, or even dams – built at Potter Heigham and Stalham. Five of the best lakes in the Broads including Hickling Broad and Horsey Mere would be lost as 25 square miles (6,500 hectares or 16,061 acres) of Norfolk – 1.2 per cent of the county’s total area – disappeared under sea water. Under the proposals, this could happen between 20 and 50 years from now, given what the document describes as the “unsustainable nature” of these sea defences beyond this point. Maintaining sea defences is a costly business, not least because vulnerable beaches need to be constantly “fed” with material to replace that washed away by the waves. There may come a point at which the government decides it is no longer prepared to throw good money after bad. Longer term, it is envisaged that a spit would develop near Winterton, behind which “coastal and inter-tidal habitats” would develop. For comparison, think of the area of North Norfolk around Blakeney and Morston. What remained of Potter Heigham, Hickling and Eccles would revert to freshwater reedbeds, while Waxham and parts of Somerton would become brackish saltmarsh, and Horsey would become an area of saltmarsh and tidal channels. What about those whose homes and farms would be lost? Where would they go, and would they be compensated? It seems nobody has properly considered these questions yet: the document concentrates on the implications for the natural environment and barely touches upon the human cost of such a scheme. 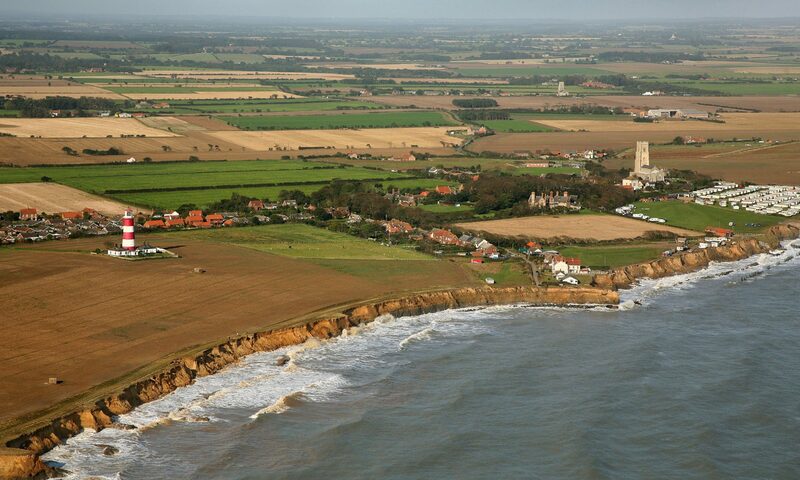 The proposals have come to light just days after North Norfolk planners refused to approve three bids to build new homes at Mundesley because the plots were on land that could be swallowed by the sea in the next 100 years. The Environment Agency has already revealed plans to abandon flood defences along the Blyth Estuary, near Southwold, over the next 20 years, claiming the costs of repairing them are greater than the benefits. Proposals for the Upper Thurne are not entirely new. They were was initially drawn up by English Nature and the Environment Agency in 2003 under what was called the Coastal Habitat Management Plan (CHaMP) for the Winterton Dunes.